You know what’s great about CMW’s website? Live streaming clickable tunes that give you a taste of the band’s repertoire. Dear CMW: please do more of this. It’s awesome. I relied on these clickable little gems last Thursday night to craft one amazing night of live music. After awaking from a power nap at 9:05 pm (! ), I was clicking on random things by 9:34, and out the door to see Sidney York at the Supermarket by 9:45. If the internet has taught me anything, it’s that sometimes you just don’t know what you want until you click on it. Sidney York is a tri-city Vancouver/Calgary/Toronto-based collaboration between three band geeks that made good. Like the band geeks from my High School, they play instruments like the oboe, the French horn, and the bassoon. Unlike the band geeks from my High School, they’re ‘effing femme fatale rockers now! Band nerds unite! The trio crafts super fun indie pop music by pairing their woodwinds, keys, and brass with a backing rock band. That made for a textured sound artfully complemented by lead-singer Brandi Sidoryk’s powerful operatic pipes. My only regret was that in my rush to leave the venue to see Martha Wainwright, I missed my opportunity to tell them how much fun they were, and also to ask whether they would marry me. 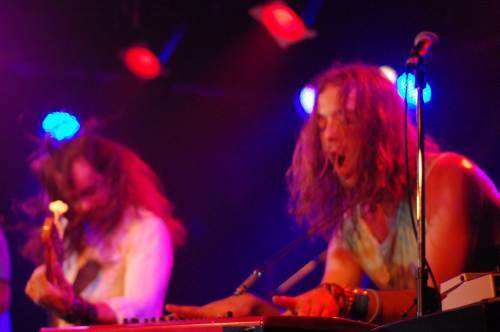 The Bright Light Social Hour is an Austin-based southern man’s band coming off a successful SXSW. When I saw this big-haired, big-bearded and big-moustachioed band setup, I had a feeling I was in for some big old-fashioned rock. I was not disappointed. The BLSH rock hard and they rock well. It’s always an amazing thing to see a bunch of musicians play with intensity and grit. It’s even better when that intensity is being guided and focused by sheer talent and hair. This modern day Lynyrd Skynyrd fuses elements of funk, blues and soul into something that is still unapologetically rock and roll. What more can I say? This was the sleeper hit of my CMW. Go see these guys. The Bright Light Social Hour is playing shows throughout eastern Ontario over the next few weeks before returning to the U.S. Check them out at Ottawa’s Zaphod Beeblebrox on March 31.